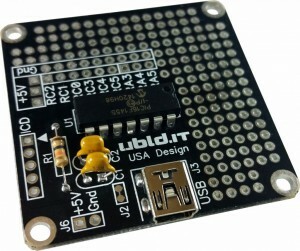 Small, low-cost USB PIC16F1455 Breakout board with an open breadboarding area. This board is capable of Full-Speed USB communications using a minimal design. Assembly is very straight-forward and DIY friendly as the design uses all through-hole components (even the mini-USB connector). Note: Some pins are shared on this PIC and may not be available for simultaneous use, please see the full datasheet for details. LED cubes, flashing, displays, etc. – The I/Os and PWMs allow a wide variety of configurations. The PCB allows for the addition of 8 LEDs with no additional components to be used in a PWM configuration (i.e. heartbeats, bar scanners, etc.). Up to 72 LEDs may be Charlieplexed using external drivers.